Taking advantage of an online discount, I snagged several volumes recently that I was really quite interested in…if not entirely "justified" in ordering. I’m at least the previous volume behind in reading on The Walking Dead. 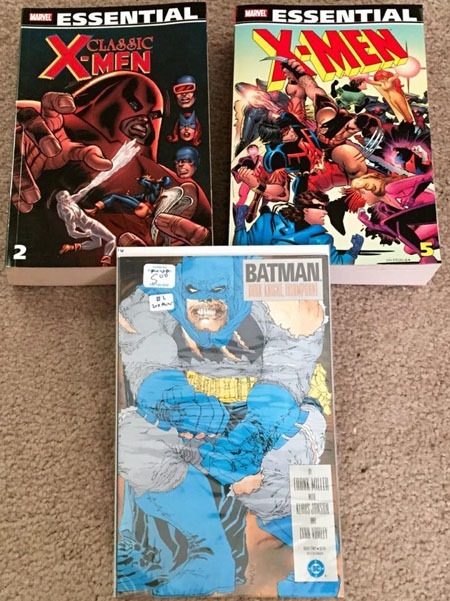 But I really did not want to let myself get away from "keeping up with" the series in collected volume format…and I can definitely see sitting down and binge-reading several in one go, my periodic binge rather than slogging through issue by issue. I’d heard really good things about Titans Hunt, and rather than track down 7 or 8 issues at $3+ apiece, I waited a couple extra months for the collected volume. While I certainly do NOT disapprove of it also containing an issue of New 52 Justice League along with the Titans: Rebirth issue…it kinda makes the Lois and Clark volume look a little light by comparison. 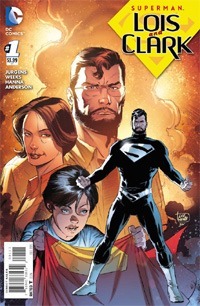 I thoroughly enjoyed Superman: Lois and Clark as a series before I had any inkling of a Rebirth or this Superman (the closest to "my" Superman I see in modern comics) "taking over," and was quite thrilled that "even though" the series was retroactively a "mini-series," it was leading into the character taking over the main books. But honestly…if Titans Hunt can include two additional issues beyond its core-titled run…why the heck did this Superman volume not contain Convergence: Superman #s 1-2?!? The inclusion of just those two issues would have pretty much made the volume as perfect a collected volume as I could imagine. I have no desire to buy one of a bunch of other TPBs "just" to have those two issues on my bookshelf. I might have to just bag the Convergence issues and slip ’em in between this and whatever’s on the shelf next to it. This is it–the week I’ve been looking forward to for awhile, at least a couple months! While I was disappointed to learn that–as I’d expected–Superman: Lois and Clark was NOT going to be some long-running ongoing series…the title’s got a darned good reason to not be continuing, as its purpose is basically ceded to the main titles. And we have the final chapter of The Final Days of Superman in the final issue of the New 52 iteration OF the Superman title. 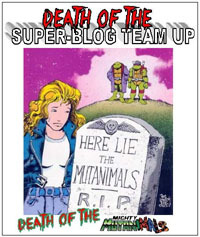 This is the eighth chapter, that I want to say I’ve followed weekly now since at least the second chapter–I don’t recall if I had to wait a week to get the 2nd or if both were already out or not when I “gave in” on the Superman #50s. Most importantly, though, we have DC Universe: Rebirth #1, a supposedly-80-page issue for $2.99. (What they neglect to advertise is that those pages include house ads for titles that begin showing up next week or so…there are only 68 STORY pages of actual content. Though I’ll certainly be drowned out in the general internet hubbub, I’ll touch on the three issues (primarily Rebirth) with tomorrow’s post. 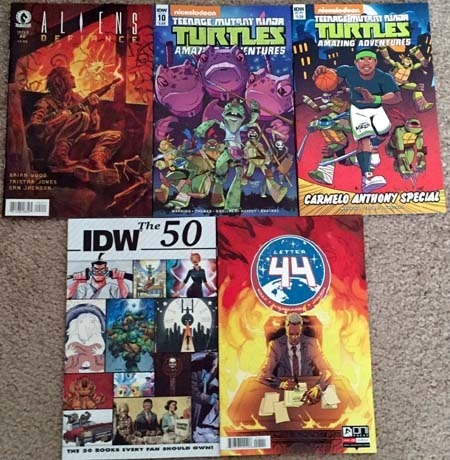 And doing what I hate, and giving me possibly my first big regret to the “standing TMNT order” for the pull list, IDW put out not only two issues of the TMNT line the same week instead of spacing them out, but two issues of the SAME TITLE, one being a totally ridiculous $5.99 ($6! What kid’s gonna drop $6 on this cartoon-based comic with some arbitrary sports star?!?) For TMNT Amazing Adventures, that makes this a $10 week! 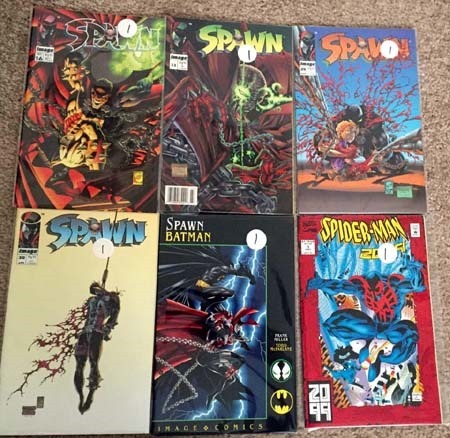 I swung by the other shop I sometimes get to, and ended up hitting the $1 bins…scoring several issues of Spawn that I don’t think I have…though the cover to #16 gives me serious déjà vu (making me think it’s 1. an image used on the cover of Wizard back in the day, 2. an issue I already have, and/or 3. an iconic image that stuck in my mind over the years from an ad [probably in Wizard if so!]). As I’m settling in with current issues and actually getting to enjoy them a bit and seeing more potential on the series, I’m increasingly interested in back issues, and kinda curious at how hard it would be for me to put together a run of the title. I also scored a couple other issues, as well as some “ephemera” (I love that word, perfectly describes a lotta the random crap I saved over the years. “Legitimizes” it and all that!). 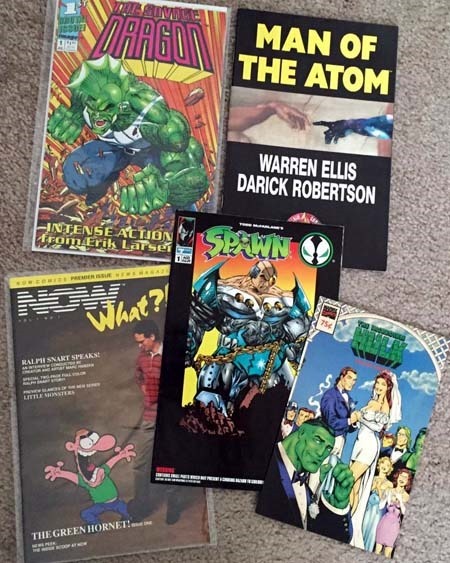 The original first issue of the first mini-series of Savage Dragon, as well as a one-shot (or at least, just one issue here) continuing the Solar, Man of the Atom property back in the Acclaim days. Ephemera-wise, there’s a promotional 75-cent Incredible Hulk ashcan; a Spawn comic originally packaged with one of the earlier action figures from McFarlane…and a Now Comics news-zine thing of some sort that piqued my curiosity enough to snag for 25 cents (though with Real Life going on right now, I haven’t a clue when I’ll get around to digging into it). No collected volumes this week, no pending orders, etc… I’m burning out a bit from the stream of recent-ish purchases…and looking at a month of a crapload of DC titles. That the DC books are gonna be $2.99 is SUCH a huge refresher, given the wealth of $3.99 stuff out there. Even stuff double-shipped that winds up costing $5.98/mo would be 40 content pages and is two issues rather than 2/3 of that for a single issue. Surely much more discussion on that angle of topics soon. This week ended up being a huge week for new comics stuff…far bigger than I’d had any intention or inkling before mid-day. DC‘s obviously getting back into my good graces (or at least attention) based on this week’s stuff. 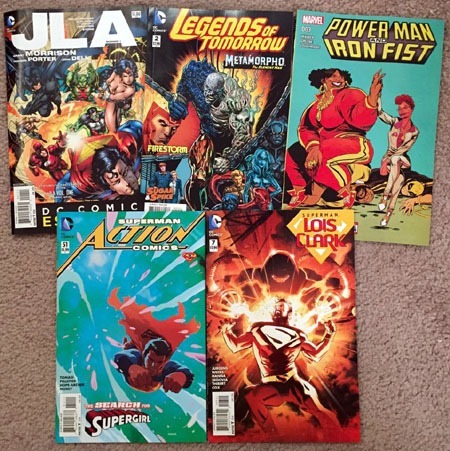 A JLA book for my $1-or-under/promo-priced pulls; Legends of Tomorrow since I enjoyed the first issue enough; Superman: Lois and Clark (seems to be prelude to stuff on a much larger scale than I’d imagined when the title started). Action Comics because I’m OCD and am interested in seeing what DOES actually happen with the New 52 Superman as well as sincerely wanting to ‘support’ an outwardly-indicated (aka “triangle numbering”) system of continuity in Super-books. And then Power Man and Iron Fist cuz ok, I’m a sucker. Of course, I need to figure out and then track down whatever would be “triangle number” #2, as I have 1 and this is 3…where the heck is 2?!? Scored the two Essentials volumes from a $3 box…figuered hey, 25% cheaper than a single issue of a new Marvel comic…you betcha! I believe the X-Men one is all-new to me. 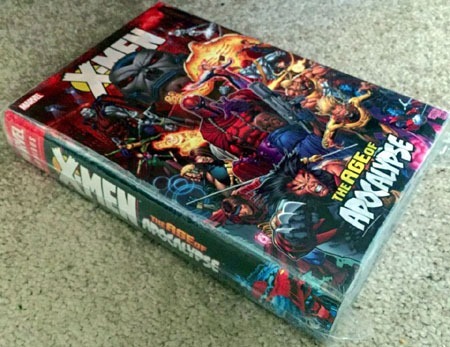 The Classic X-Men is a replacement copy so I’ll have 2 of 3 volumes in the same trade dress instead of 3 volumes and 3 different trade dress styles. And for the price of any of the recent DC #50s (or the Barnes & Noble/BaM! 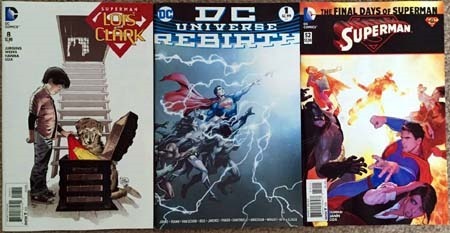 standard price of most issues) got a second print of Dark Knight Returns #2 (Dark Knight Triumphant)! And finally (of new stuff), the book I’ve been waiting for since last August finally came out (in a new/second printing), but now being ‘current’ and NOT “out of print” it was discounted significantly through instocktrades and thus “affordable” in a way that cover price–for me–is not. I’d ordered this last week and it arrived today, neatly coinciding with New Comic Day. Second print? Looks fine to me! Looks like it’ll match the Companion volume? That’s what I wanted. Saved nearly $60 off cover price? I’m great with that!